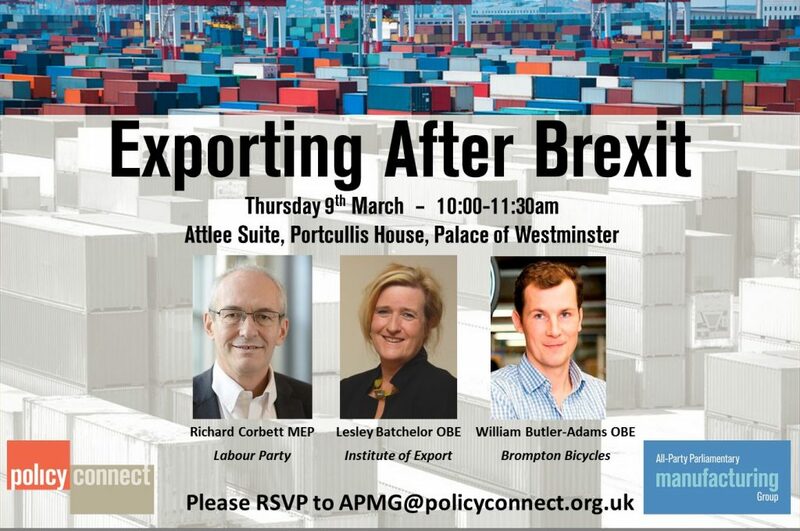 Open to Export CEO and Director General of the Institute of Export and International Trade, Lesley Batchelor, will be appearing on a panel discussion being hosted by the All-Party Parliamentary Manufacturing Group at Portcullis House on Thursday 9th March (10-11:30). The panel also includes Richard Corbett MEP – Deputy Leader of the Labour Members of the European Parliament, author of “How Does Europe Work”, former advisor to Herman Van Rompuy – and William Butler-Adams OBE – Chief Executive, Brompton Bicycles. Please click here to RSVP to the event, or email George.dibb@policyconnect.org.uk.